And the worst part is: they still have to work together. The Man of Steel and the Amazing Amazon have been dating and co-starring in a team-up title for the better part of two years now. The dalliance between Superman and Wonder Woman always seemed like a concession to the fan-fiction idea that DC’s two strongest characters HAD to hook up. But maybe they don’t have to anymore. Superman’s had a lot going on in his life of late, what with the whole losing-most-of-his-powers and secret identity outing of the last few months. Wonder Woman’s had her own share of drama, too, with an open revolt on her home island of Themiscrya among other things. But, in this week’s Superman/Wonder Woman #22, it’s Clark Kent’s status quo shifts that trigger change in his romance with Wonder Woman. Just three months ago, it seemed like Clark and Diana’s love would be able to weather all the upheaval in their superhero lives. But then they had a run-in with a secret government operation that rounded up Clark’s closest friends and family. During that adventure, Diana used her magic lasso on some of those people to find out how they felt about Superman. Now that all the action’s over, it looks like Clark’s romance with Diana is another casualty in the wake of the recent big changes. Much has been made over the decades about how Clark Kent’s love for Lois Lane humanizes Superman and keeps him tethered to humanity. But part of the appeal to a Supes/Wondy romance is the idea that they’re equals in terms of fictional strength and publishing longevity. 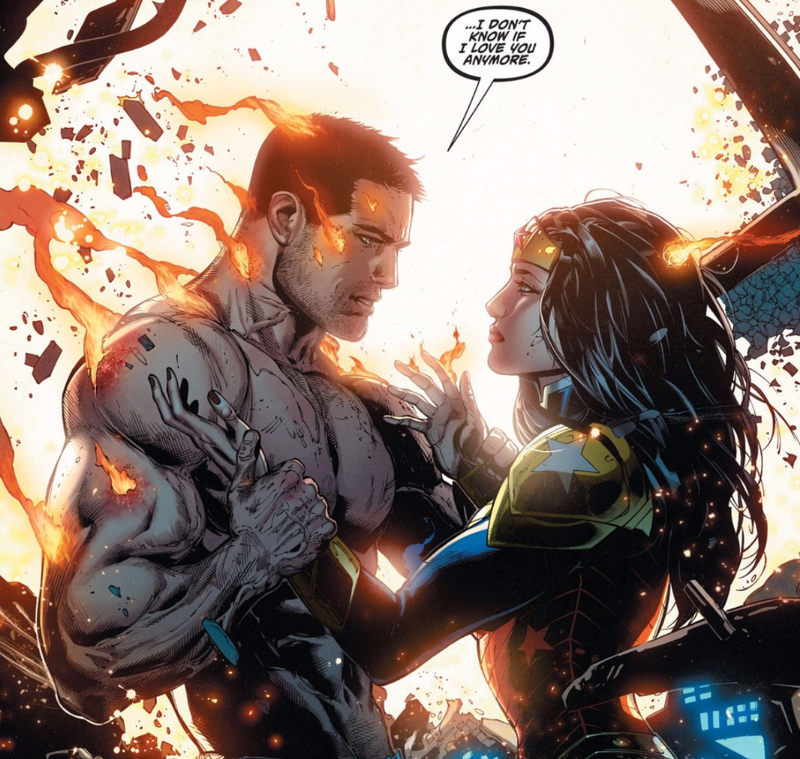 Clark and Lois have never been romantically linked in the four-year-old New 52 incarnation of the DC Universe and they’re barely been civil ever since she revealed his secret identity to the world. So it’s weird that it’s Diana’s treatment of Lois (and others) that proves to be the wedge that might push Clark away from her. The oddest thing about this issue is that it re-tells scenes that were shown months ago in a preview teaser. That same sequence gets changed a little be in this issue. From a character-driven standpoint, one can understand why Clark might want to put his love life with Diana on hold. It’s a human reaction that happens in real life. And part of the tension between the two heroes comes from the different ways they have been written with regards to their pursuit of justice. Diana’s been more pragmatic and less idealistic than Clark in this story arc. But part of the problem with superhero romances is that they can feel icky when just used as plot points. Yes, romantic drama and upheaval are good engines for plotlines and character development but they can also ultimately reduce some people in a given story to devices for another’s journey. I found myself asking “so what happens from here?” after reading this issue. Does Diana pine away for Clark, hoping that he’ll come back to her when he gets all of his powers back? Does Clark recognize that Diana was acting—perhaps, misguidedly—out of love for him? Who winds up being the jerk and/or the victim? Is there anyway this can be an amicable break-up? It’s probably a safe bet that Superman or Wonder Woman won’t be becoming each other’s archenemies now. But it’ll be interesting to see what the aftermath of this parting—if it actually sticks—looks like in each character’s world.